Alectinib is an anti-cancer ("antineoplastic") targeted therapy. It is classified as a tyrosine kinase inhibitor ALK (anaplastic lymphoma kinase) gene mutation. 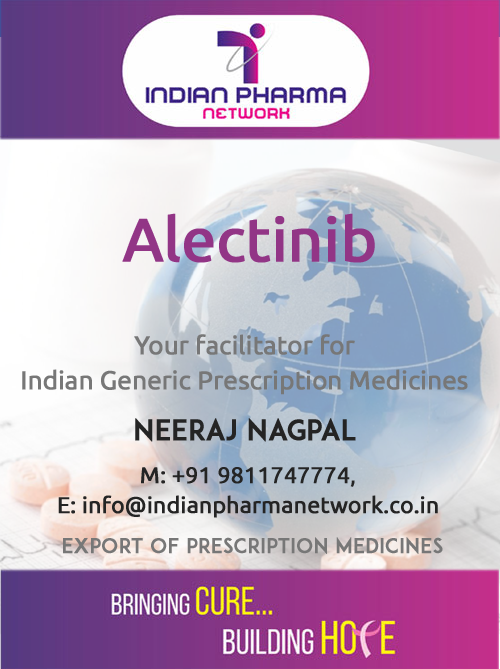 Please call at M: +91 9891296838 to buy and know more details about the generic FDA approved Alectinib medicine available in India and its cost price. Alectinib Brands Available in India. Alectinib is an oral drug that blocks the activity of anaplastic lymphoma kinase (ALK) and is used to treat non-small-cell lung cancer (NSCLC). Alectinib was approved in Japan in July 2014 for the treatment of ALK fusion-gene positive, unresectable, advanced or recurrent non-small-cell lung cancer (NSCLC). It was granted an accelerated approval by the US Food and Drug Administration (FDA) in December 2015 to treat patients with advanced ALK-positive NSCLC whose disease worsened after, or who could not tolerate, treatment with crizotinib. For procurement of Alectinib brands in India, sold by Indian Drug Manufacturer. Please call at M: +91 9811747774 or Email Us to know more details about the medicine and its cost price in India. For Indian Patients Alecensa (Alectinib) can be made available to patients, doctors and hospitals at Mumbai, Kolkata, Hyderabad, Chennai, Ahmedabad, Delhi, Bangalore, Srinagar, Jammu, Jaipur, Chandigarh, Ludhiana, Noida, Gurgaon, lucknow and Pune and other cities in India. For overseas patient Alecensa (Alectinib) brands in India can be also made available to overseas patients, doctors and hospitals. The order will be confirmed only after the receipt of valid prescription of doctor and import permit if applicable. Alectinib Biosimilar approved and marketed in India is available as 150 mg capsules.